Unwieldy, overlong and overly reliant on melodramatic coincidences, “The Place Beyond the Pines” is still better than it has any right to be, thanks to its cast. The director of “Blue Valentine” has that film’s star, Ryan Gosling, do a motorcycle bandit version of the character he played in “Drive” in an engrossing story of a carnival stunt cyclist who takes to robbing banks to support the infant son he didn’t know he had. Where things turn cumbersome is when Cianfrance grafts on what happens after the bank robberies, the tale of the cop (Bradley Cooper) from a political family, who also has an infant son. And it all wends its way toward an eye-rolling “sins of the father” generational mash-up that is well-acted but eye-rollingly ludicrous. Cianfrance has made a fine audition for a TV mini-series, but a frustratingly top-loaded movie. Gosling, his insouciant pout wrapped around an omnipresent cigarette, is a study in tattoos, tattered inside-out t-shirts and carny-tough cool. He travels the land, riding motorcycles in a Sphere of Death stunt-show, hurtling around a metal cage in concert with other dirt bikers. He may have a woman in every town. But in Schenectady, New York, the short-shorts bra-less bombshell Romina (Eva Mendes) stuck in his memory. She drops by his show and wears a resigned, depressed “what might have been” face when he offers to give her a ride home. She knows what happened, and she knows there’s no future here. “Awesome Luke,” the daredevil, is too immature to deal with the blond boy he fathered last time through town. Luke impulsively quits his job and makes plans for the baby and Romena that her life right now can’t accomodate. That’s when he falls into bank robbing. And that’s where rookie cop Avery Cross (Cooper) enters the picture. As Cross takes charge of the narrative, involving police corruption, political wheeling and dealing, a clever screenwriter might have said “but that’s another story.” Cianfrance & Co. don’t, and they add yet another narrative to the first two. The motorcycle chases (sped up to make Gosling’s riding more stunt worthy) are arresting. Gosling’s ability to play brilliant in one film, simple and naive in the next, is a modern marvel. He’s also a mannered, fussy actor who puts bits of business into most every shot. Mendes adds walking wounded to her repertoire and does well with it. And Cooper makes a nice, uncluttered contrast to Gosling’s fidgeting. 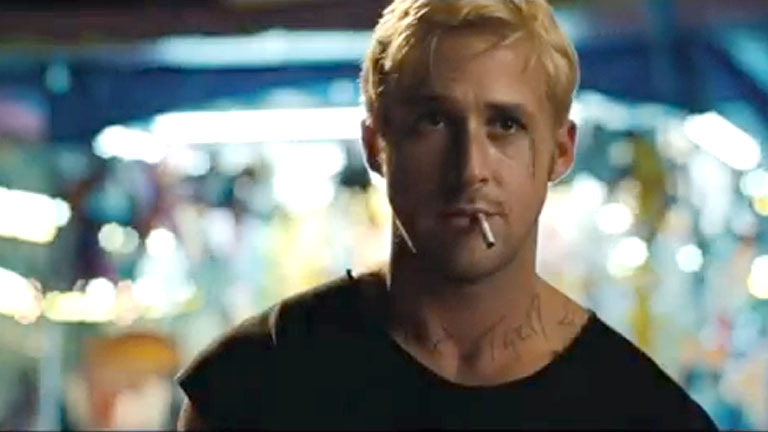 But “The Place Beyond the Pines” loses its momentum when the narrative shifts. The script contorts every time it changes narrators and grows less interesting with every passage of time. Whatever is in that “Place Beyond the Pines,” Cianfrance has squandered our interest in it long before it arrives. MPAA Rating: R for language throughout, some violence, teen drug and alcohol use, and a sexual reference. Credits: Directed by Derek Cianfrance, written by Cianfrance, Ben Coccio and Darius Marder. A Focus Features release. It is entirely unclear to me whether you are complimenting or criticizing Ryan Gosling’s acting abilities. “Fussy” and “mannered” seem to me a pretty serious comment, at least to how he is here. Repeating himself (“Drive”) might be another clue. I like him, but he’s more busy than natural in these macho cool parts.